Since I already stuck my nose in this, I thought I'd follow up last night's thoughts with a more practical post. Vast amounts of bandwidth have been used in recent days as American Christians debate what other people (namely the government) should do in response to the Syrian refugee crisis. I am fascinated by the intensity of outrage some direct toward others because of their opinion about what someone else should or should not do. Realistically, most of us have little to no impact on what our country will do in response to this crisis. So where our national policy finally lands seems like a really silly thing to get angry about. 1. Pray for the refugees. My cousin-in-law who lives in Greece wrote the following, "As someone who is watching these refugees arrive 'live' here in Athens, Greece, I can tell you confidently those arriving here are not strong, healthy men ready for war. These are broken and helpless people arriving traumatized and with nothing... we see many women and children sleeping on pieces of cardboard throughout our city and in desperate need." Whether or not there are terrorists among their midst, many of these people are in desperate need. Pray for them. 2. Pray for your government officials. This is not a simple situation. There is not a clear answer. Those in power must find a balance between compassion, and safety and they must do it in a timely manner with an eye on our own country's resources. They need Gods wisdom. Pray they receive it. 3. 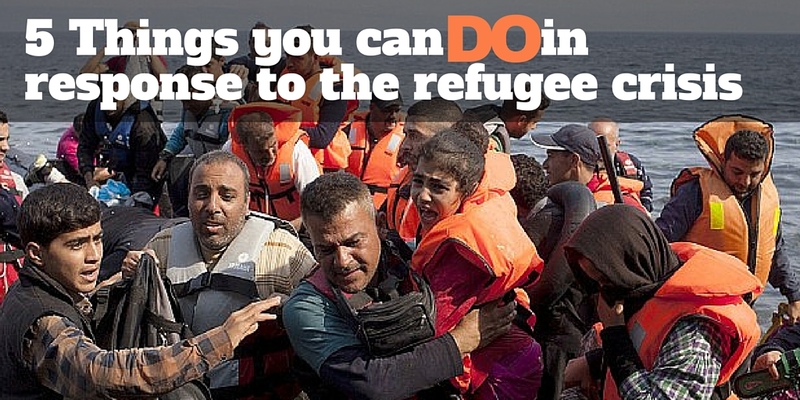 Support an organization that is currently assisting refugees. The Nazarene Fund is one place to donate. There are many others as well. 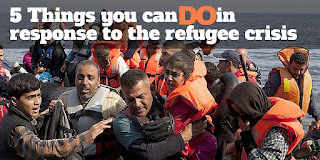 Just google "assist with Syrian refugees". You'll find a place you can make a donation. 4. Bake cookies for your neighbor. Seriously. In all the talk about loving our neighbor, let's not forget to do that as literally as possible. Love your neighbor. 5. Clean out your closet. There are people in your city who are in similarly dire straights as the refugees. Heroin, human trafficking, homelessness and other "Giants of Despair" are wreaking havoc especially as the winter rolls in. Find a local shelter, contact them to see what they need and then clean out your closet. Don't just get rid of your old stuff. Give away your best stuff if that's what they need. No one wants just the muffin stump. There are likely many other things you can DO during this time. At risk of speaking harshly... if you aren't willing to do some of these things, maybe you could just stop talking about the crisis all together. If you aren't taking action, you obviously don't mean it. Let's all try not to be quite so outraged, let's cast a few stones fewer. As the great country singer once said, "A little less talk and a lot more action!"